Red clover is not mentioned in the Bible. Its Latin name is Trifolium pratense, meaning “three leaves” and “of a meadow/field/pasture”. Trifolium pratense, is native to Israel and surrounding areas. 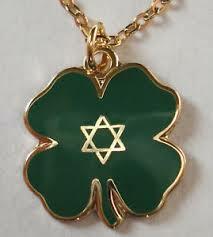 but the Hebrew word for clover, תִלְתָן, tiltan, is post-Biblical. Biblically, there are a number of Hebrew words that may be translated at “meadow,” “pasture,” or “field”: ,אָחוּ ,אֲפָר נָוֶה ,מִרְעֶה, שָׂדֶה (achu, afar, mir’eh, naveh, sadeh) each of which has a somewhat different meaning. Although it may be surprising that there is no mention of a native plant in the Bible, it is not surprising that there are so many ancient Hebrew words for open fields, for the Israelites, once they stopped wandering, were shepherds and farmers. Fields, meadows, and pastures were an intimate part of their daily life, living as they did in constant and close relationship to the land. I have childhood memories of pulling out the individual flowers from the inflorescence, or flower head, of a red clover, and sucking out the sweet nectar within, a tiny tasty treat during a walk across a field, pasture, or meadow. 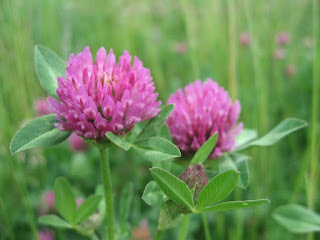 Recently, having developed an interest in foraging, I have become more closely acquainted with red clover. I’ve discovered the culinary delights and health benefits of this common plant, introduced to North America and now naturalized. Red clover jelly, made from an infusion of the flower heads, is sweet and delicious. Dried red clover flowers provide a touch of sweetness to herbal tea. The flowers are highly nutritious, containing many nutrients, including Vitamin C, potassium, calcium, magnesium, and other minerals. Historically, it has been used to treat throat conditions, and it contains isoflavones, plant chemicals that act like estrogen. Through connecting with the Latin name for red clover, and the meanings of its words, it is possible to make indirect connections between red clover and the Bible. The other part of the Latin name of red clover, Trifolium, connects to a common theme in Judaism, three: the three patriarchs, Abraham, Isaac, and Jacob; three types of Jews: Kohanim (priests), Levi'im (Levites), and Yisrael (Israel - everyone else); Moses as the third child in his family; the Israelites beginning the three-day process of preparing themselves to receive the Torah on the third of the month of Sivan. Franz Rozensweig, an early 20th century Jewish philosopher, famously put together two triangles, forming a Magen David, or Star of David, with two sets of three that together define Judaism and what it is all about. 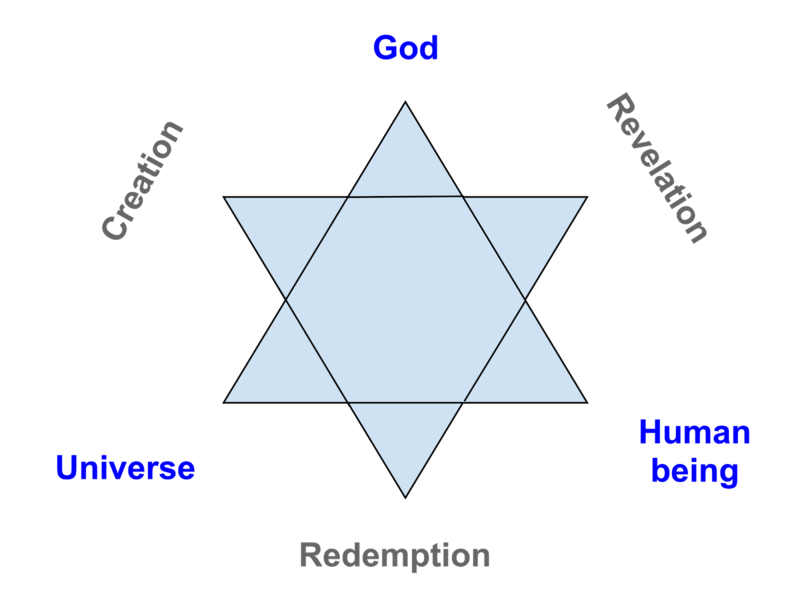 On one triangle, the universal elements: God, humans, and the Universe; on the other triangle, the three key moments in defining and establishing the Jewish people: Creation, Redemption, Revelation. In today’s world, when it is possible to find just about anything on the Internet, a quick search will locate a clover leaf (with four-leaflets, not three) with a Star of David embedded within it. As I sip my cup of red clover tea or enjoy red clover jelly on my toast, these foods that nourish my body take on extra meaning. Not only does this common plant connect me to the cycle of the year, reminding me that its flowers are abundant only in early summer, though still to be found as the heat builds, but it also connects me to the Land of Israel, where it came from, and to the Creation of all plants. Not only do my pluckings of red clover flowers on my outdoor wanderings connect me to the land more intimately, but each flower inflorescence, with its attending three-part leaves, reminds me of the importance of creation, revelation, and redemption in my own life, as well as how I am connected through the Holy One and the planet to all other human beings. Not only am I finding relaxation and healing being out in nature, but I am also reminded that G!d leads me beside still waters, and lays me down to rest in green meadows. All of these images and thoughts are my gifts for engaging in foraging as a spiritual practice. To learn about the next opportunity for group foraging as a spiritual practice, click here to go to the One Earth Collaborative website. Stop. Stop everything. Totally change your life. Drastically reduce your carbon footprint. Do everything you can to increase carbon sequestration. This is what climate change demands of us. But the vast majority of us are not doing it. Changing our physical impact on the planet is the What about how we respond to climate change. People have many, many, many different opinions about the best way to try to ensure the survival of human life on this planet, and few of us are in a position to intelligently judge them. But in addition to the What, and no matter which way the future leads us, there is also the How. How we go forward, in whatever we do, is as important, if not more important, than What we do. Here are 10 Ways to Respond to Climate Change - and to all the painful things that happen in the world - in terms of the How. We speak of G!d as El Malei Rachamaim, G!d full of compassion. To strive to maintain compassion is to strive to walk in G!d's ways. In the face of violence, hatred and environmental degradation, may we respond to people and situations around us with compassion. Our liturgy reminds us daily of G! 'd's love for us: "Ahavah rabbah ahavtanu, With great love You have loved us," and we are commanded to love G!d "b'chol l'vavcha, uv'chol nafshecha, uv'chol me'odecha, With all your heart, with all your soul, and with all your might." (Deut. 6:5) Let us love all of G! 'd's creation, every bit of it, from every person to the most distant star to the tiniest bacterium, let us keep on loving, without end. Judaism teaches us to engage in acts of loving kindness - gimilut chasadim, and to do them without expecting anything in return. Let us respond to those around us with kindness, even when our desired response might be something harsher, and may we do so without the expectation of being repaid but rather because it is the right thing to do. I invite you to consider faith as a state of being rather than in terms of having faith in something. We may have faith in G!d, and this faith may give us the ability to live in a state of faith, but living is such a state doesn't require faith in anything in particular. Rather, it is about trusting in our hearts that no matter what happens, somehow, we will - from a spiritual standpoint - be OK. May we maintain our faith in the face of the deepest challenges to that faith. In the Book of Job we read, “Where shall wisdom be found? Humans do not know the way to it. It is hidden from the eyes of all living things, G!d understands the way to it.” (Job 28:12, 21, 23) Wisdom may be beyond our reach, but the search for deep wisdom is incumbent upon us as a constant in our lives. May we constantly endeavor to access our deepest possible wisdom. In the face of the news and the events around us, fear, despair, anger, grief, and dread can easily envelope us. Courage is required only when we are afraid or otherwise feeling immobilized or unable to act positively. When we are unafraid, we do not need courage - acts are easy to do. May we find the courage to move forward with positive energy, even when confronted with sheer terror or disabling grief. Strength may be physical, but it can also be spiritual, and in times of trouble we need to reach deep within our souls to find our untapped sources of spiritual power. It would be more pleasant not to have to be strong, but our world today cries out to us to find strength we don't realize we have. May we discover new depths of strength whenever we need to do so. The turning point between commandments related to G!d and commandments related people in the Decalogue, or Ten Commandments, is #5: "Honor (Respect) your father and your mother." (Ex. 20:12). Our parents are stand-ins for G!d in the physical world. Respecting our parents relates to respecting G!d, and respecting G!d means respecting all of G!d's handiwork, no matter what we think of other people or different ideas. Let us respond to the people and ideas around us with the understanding that they, too, are part of G! 'd's holy Creation, and worthy of our respect. It is so easy for us humans to think that we know better than someone else, or perhaps even than everyone else. But we are each an infinitesimally tiny spec in the expanse of the Universe. "What are we, that you are mindful of us?" (Ps. 8:4) the Psalmist asks, and it is a question for each of us to ask ourselves as well. May we remember that our knowledge is as limited as our physicality, and may we approach all that we do with humility. Day in and day out, if we maintain our personal integrity, all of the other nine ways of responding will fall into place so much more easily. Our centeredness, our ability to stay grounded, these help us to maintain our sense of faith and well-being. May our feet and our hearts remain planted firmly on the ground, no matter how high we may fly or how low we may sink. All of these ten ways of responding come down in the end to just one thing, keeping our hearts open, letting our hearts open wider all the time, and strengthening our connection to the Mystery of the Universe, to all of humankind, and to all the amazing Creation of living and nonliving things with which we share this amazing planet. May you go from strength to strength. May you keep your heart safe and open. May you find your best way to be in this world. These thoughts were first shared at the Climate Mobilization Teach-in and Public Gathering in Boston on Sunday, July 10, 2016. What is at stake is a social movement, a call for social change in social theory and practice. Technology is transforming our society continuously, industry is recklessly dynamic, yet our thinking is static. Prosperity and comfort have made us listless, smug, indifferent. We enjoy our privileges, we detest any dislocation in our intellectual habits. But automation is with us, and so is poverty, and unemployment.. These words sound appropriate for today, a day when the need for a universal call for social change rings loud and true. The events of the past week, with killings in St. Paul, Baton Rouge, and Dallas, are another reminder of the deep pain that envelopes our nation, and our world. We grieve - we grieve for lives violently and needlessly cut short. We grieve for the loss of hope. We grieve for our loss of innocence. We grieve for the knowledge of what human beings can do to each other. We grieve for what these events may trigger in the future. Our hearts are heavy with pain. We long for change, real, substantive change that will make our world a safer and more equitable place. We long for wisdom and compassion to rule the world. We long for a sense of brotherhood and sisterhood. We long for friendship that endures. We long for peace. The quote above is not from this week, or even this year. These words are from a talk entitled “The White Man on Trial,” and they were spoken by Rabbi Abraham Joshua Heschel in February 1964. They sound discouragingly contemporary. Rabbi Abraham Joshua Heschel also said, “There are three ways to mourn, the first is to cry, the second is to grow silent, and the third is to transform sorrow into song,” and, in reference to marching at Selma with Rev. Martin Luther King, Jr. he said, "I was praying with my feet." To begin, we understand that we are not alone. Our neighbors of all colors are grieving, too. And so, we need to weep. We need to cry out our grief, and also our anger and our pain and our despair. And we need to understand that these emotions we feel are a sign of the goodness in our heart. They are a sign of our caring and our compassion. They are a sign of our ability to love. Let our grief flow, let it flow that we may know that we are human. Let is flow, that we may heal. And then, let us grow silent. Let us grow silent and allow the voice of Mystery to well up within us, to heal our hearts and show us the path forward. Let us grow silent that it may be our love and compassion and not our anger and our despair that drive us forward. Let us grow silent that the Voice of Meaning may speak in our hearts and our souls. Let us grow silent. And out of our silence, let song spring forth. Let prayer spring forth and propels our feet into meaningful and compassionate actions to bring healing to our communities and our nation. Let us sing our a song of justice, and let us pray with our feet. The world may sometimes feel like it doesn't change, but it does, and we are the agents of that change. Let us harness our grief to do good in the world. Shabbat shalom - may the One who brings peace to the high heavens bring peace to our hearts and to our world.